Although women in India are entering the workforce in increasing numbers, almost half drop out between early and mid-career. In India women comprise 24% of the workforce, and only 5% reach the top, compared to the global average of 20%. In addition, there are 1500 board seats to fill (Current Catalyst Census) and only 9.5% women sit on the board of the top 200 companies. The Companies Act, 2013 , passed by the Indian parliament, makes it mandatory for public and private firms with an annual turnover of at least three billion rupees ($50 million) to have at least one female director. India does not have a structured, integrated development solution to build a pipeline of senior women leaders in high growth markets. 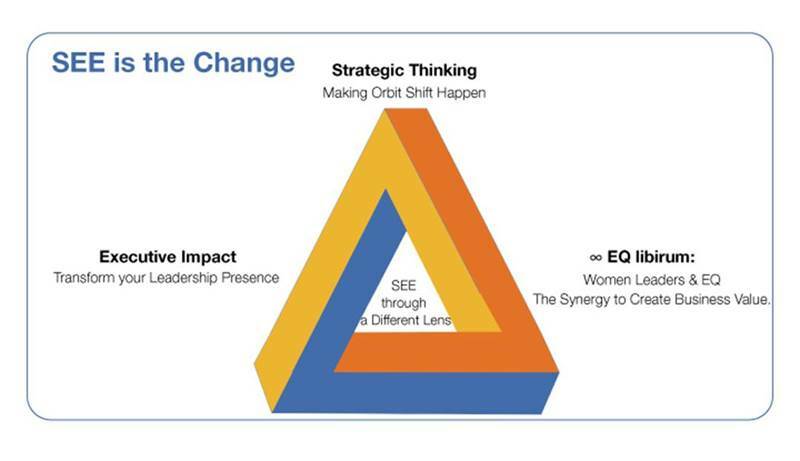 In response to this gap, PotenciaMentis Global Consulting has derived a development model called SEE, based on both Catalyst and McKinsey’s extensive research in the women leadership space. 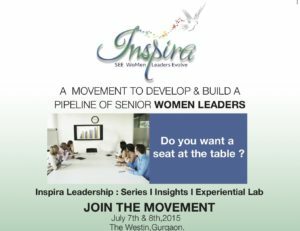 INSPIRA: SEE Women Leaders Evolve is a movement to fill this gap and it places EQ at the center of its model. 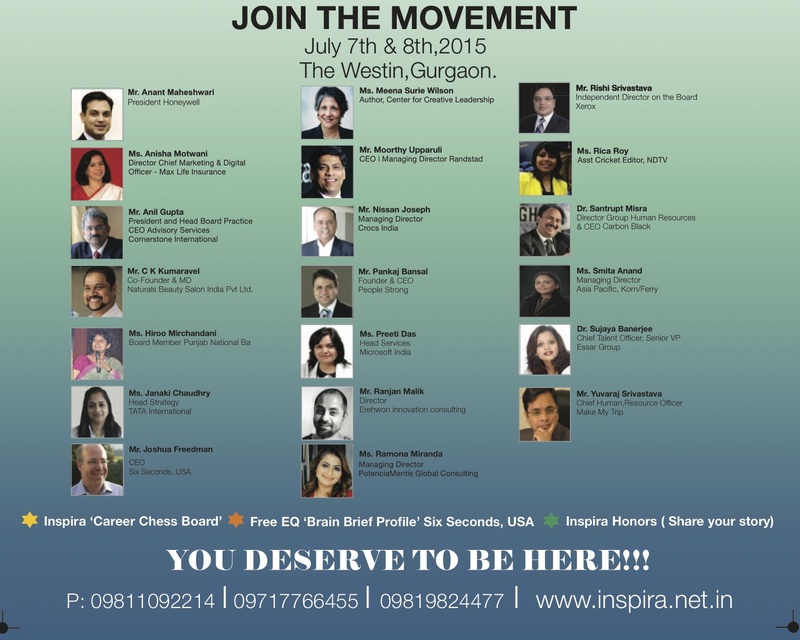 Day one is carved out as a conference format with CEOs| Leaders covering the spectrum of SEE. Day two will be experiential – we have gurus in the space of Strategic Thinking (Ranjan Malik, Director Erehwon Innovation Consulting) & Executive Impact with Emotional Intelligence (Joshua Freedman, CEO Six seconds, USA) to inspire & hone women leader skills. What is the SEE model & what will it impact ? Strategic Thinking | Executive Impact | Emotional Intelligence – This development model has been derived from the extensive research that McKinsey & Catalyst around women leaders. “When there’s that moment of ‘Wow, I’m not really sure I can do this,’ and you push through those moments, that’s when you have a breakthrough.” Marissa Mayer, CEO of Yahoo! The big question is how to shift an orbit, strategically – be it a product, process, business model, a market, or a country. 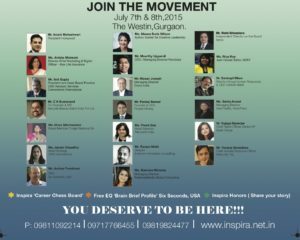 Ranjan Malik the guru on innovation will provide a hands-on experience at INSPIRA. There is a global 75,000 data point study done by Six Seconds: The Emotional Intelligence Network, called the “State of the Heart” Survey. It’s basically an EQ SWOT that enables us to understand how we can we bring out EQ to our life and work every day. In the results of the Six Seconds’ survey, Mr. and Ms. Average reflect as nearly opposite on EQ Competencies. The greatest weakness of Mr. Average is the ability to pause and consider impact of decision before taking action (apply consequential thinking). And women have this as their strength. Ms. Average’s greatest weakness is navigating emotions around issues such as office politics, being stuck in the organizational matrix, advancing her career, etc. A women leader finds it difficult to navigate emotions in a way that rises above these challenges. The question is, how we can learn to exert influence beyond the matrix and learn to navigate it as well? If you are running a business, performance is your benchmark. If you take this seriously, often you are faced with giving up preconceived notions or habits, looking at the data, and adapting your practices. The data are increasingly clear: Women do create a leadership edge for your business. In our surveys of business leaders, the vast majority of issues are around people performance – getting and keeping talent, and building alignment. On average, women leaders are better at solving those challenges. The SEE model helps women increase effectiveness in areas where they struggle and in areas where they area already strong. 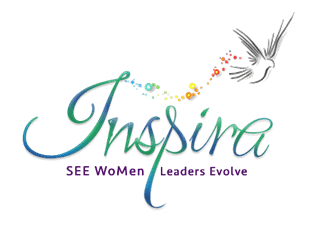 INSPIRA is only the spark to the movement that we hope will gain momentum and energy as it builds. Special thanks to Ramona Miranda for supplying text for this article. Peabody Award-winning broadcaster and communications professional, editor, producer, and writer for effective outcomes. Ms. Goodman has been a radio producer for much of her career, specializing in short features and documentaries. Some of her work includes Southern Songbirds: the Women of Early Country Music, Pastures of Plenty: A History of California's Farmworkers, and The Boomtown Chronicles: Reflections on a Changing California. Ms. Goodman teaches journalism at Cabrillo College in Santa Cruz County. Her goals are to facilitate positive change in the world through effective communication, and to continue conducting her work with the highest level of integrity possible. Ramona, this conference is so exciting. Congratulations for all the effort you’ve put into pulling it off since we first talked over some of your ideas back in September. You are a tremendous role model for this group. It looks to be a terrific learning experience that will have a life changing impact. I wish I could be there with you, Josh, and all these strong women. Cheers and best wishes!